Earn your customers’ trust and loyalty by proving how well you understand them. Google has spent years delivering recommended content across flagship properties such as Google Ads, Google Search, and YouTube. Recommendations AI draws on that experience to deliver personalized recommendations that suit each customer’s tastes and preferences across all your touchpoints. Ask your Google Account Manager about this limited beta opportunity. Recommendations AI uses Google’s latest machine learning architectures, which dynamically adapt to real-time customer behavior and changes in variables like assortment, pricing, and special offers. Early results from retailers around the world have shown dramatic improvements on previous recommendation systems, with some achieving up to the following results. * Source: Google LLC. Actual results will vary by retailer. No need to preprocess data, train or hypertune machine learning models, load balance or manually provision your infrastructure to handle unpredictable traffic spikes. We do it all for you automatically. Integrate your data, configure and launch recommendations, and monitor system performance, all from an easy-to-use graphical interface. Quickly connect data by using existing integrations with Google Tag Manager, Google Shopping, Google Cloud Storage, and BigQuery. Put all your data to work producing great predictions by incorporating unstructured metadata like product name, description, category, images, product longevity, and more. Customize recommendations to deliver your desired outcome: engagement, revenue, or conversions. Easily apply business rules to fine-tune what shoppers see, diversify what products are shown, filter by product availability, custom tags, etc. Offer first-time users and loyal customers alike high-quality recommendations via web, mobile, email, and more, anywhere in their journey from homepage to shopping cart to order confirmation and more. Your data and models are yours and yours alone. They’ll never be used for any other Google product nor shown to any other Google customer. You’re never locked in, and can delete your data and models anytime. Pay only for the predictions you consume. Google covers all underlying infrastructure costs. With one click, you can seamlessly deliver curated recommendations with low latency to customers anywhere in the world. It supports international product catalogs and multiple geographies. Recommendations AI is compliant with the General Data Protection Regulation (GDPR). See terms for more information. Context: device, domain/URL, month/week/day, etc. Pay only for the predictions you consume. Recommendations AI costs $0.35 per thousand prediction API calls. There is no charge for the first 20K predictions each month. Google covers all underlying infrastructure costs. Recommendations AI was easy to integrate with our existing recommendations framework, and enabled us to deliver next-gen recommendations without a ton of work. We are steadily investing in data science and it is very helpful for us to be able to integrate and test different algorithms. Recommendations AI performs really well on our product detail pages and increased conversions and revenue significantly. We were genuinely impressed by the performance of Recommendations AI over our old recommendations system. We designed our model to drive total shopping revenue per visit, and the 3.1% increase was greater than expected. We saw significant increase in the interactions with recommended items and also an overall uplift in CTR, AOV, and conversions. Recommendations AI was a clear winner and we’ve since rolled it out to all of our users. 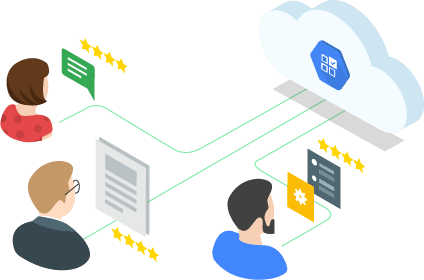 More ways the Google Cloud Platform can help you win the hearts of your customers. Get the details on how Recommendations AI works.